Increased availability and relaxed regulations mean that almost everyone will know someone who got a drone for Christmas and they'll be dying to use them at your wedding. And more and more professional photographers will be adding drone photography to their packages. Drones rely on batteries with a short life and, relative to the amount of time they can fly for (approximately 20 minutes) a long re-charge time. Whether or not the drone will be part of your photography package on the day is weather-dependant. Drones, being electronic devices, cannot be exposed to rain or snow, and are unsafe in windy conditions, so unless the day is calm and clear, the drone will have to remain grounded. .... For safety reasons, drones should not be flown indoors, in or around a tent or marquee, where there are many large trees, or anywhere with overhead telephone or electrical wires. If you are getting married at a wedding venue, you will need also to make sure that the venue is aware of your plan to fly a drone on the premises and gives approval to do so. Any use of a drone needs to be coordinated with your professional photographer and videographer to ensure that their capacity to deliver the photographs and footage as per your contract isn’t compromised. You should also consider the potential of a drone to disrupt your wedding and distract your guests. There is no way to fly a drone discreetly. 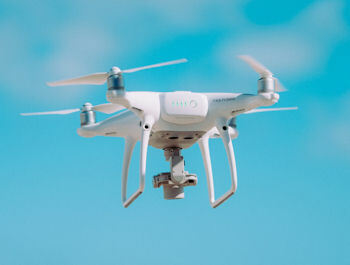 Drones are noisy, and, because they are something new, if one flies over your wedding ceremony the eyes, and attention, of every guest will be above the ceremony and not on it. It would also be a good idea to forewarn guests, so they are not startled by the drone. And, very important, you should ensure that you are covered by insurance.